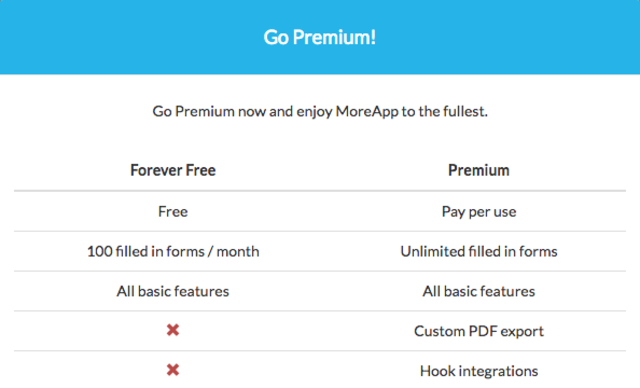 As from September 15 we will add a new pricing option for our users: MoreApp Forever Free. If you sign up you automatically get a Forever Free account. You can use all basic features with a limitation of 100 credits per month. The Premium account is Pay-per-use. Custom PDF reports, paid hooks & widgets from the MoreApp Marketplace are only available for Premium accounts. When you sign up you enter the Forever Free mode. A bundle sale will activate the Premium mode. You can't switch back to the Forever Free mode. If you have questions, please send us an email!